to make it easy for other people to access this information through a Web interface, browse entries, search, download files, and optionally add, update, delete or comment on entries. its simplicity of use : you don't need to be a seasoned server operator and/or an experimented database administrator to run ELOG ; one executable file (under Unix or Windows), a simple configuration text file, and it works. No Web server or relational database required. It is also easy to translate the interface to the appropriate language for your users. its versatility : through its single configuration file, ELOG can be made to display an infinity of variants of the weblog concept. There are options for what to display, how to display it, what commands are available and to whom, access control, etc. Moreover, a single server can host several weblogs, and each weblog can be totally different from the rest. Personal Logbooks. Personal notes can be written into ELOG and can then be retrieved from anywhere with a Web browser. This makes it handy for PC supporters who have to go around in companies or laboratories and don't want to carry their paper logbook with them. The same holds true for people traveling around a lot. The logbook database consists of plain ASCII files which can copied easily between different computers to have local access, for example on a notebook with no network connection. Shared Logbooks. Logbooks can be shared by several people, for reading and optionally for writing. This way workgroups can share and exchange information like in a (simplified) news group. This is supported by the Reply command in ELOG which creates "threads" of entries. Users can be notified by email when new entries are added to the logbook. Compared to that of a news server, the installation of ELOG is much simpler. Small Databases. Since arbitrary attributes can be defined for a logbook, it can be used as a small database with search facilities. Problem collections. A system can consist of two logbooks, in one of which users enter bugs or problems. 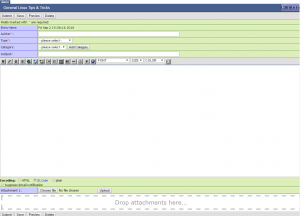 If someone adds a problem, an email is automatically sent to the administrator, who can then copy the entry to the second logbook and add the solution to the problem. Users can then look up all fixed problems. Shift Logbooks. If the Allow delete and Allow edit flags are off, an entry cannot be modified once it's been entered. This can be useful for shift logbooks for example in accelerator control rooms where each entry becomes a "document" with a time and author stamp. ELOG was originally developed as a shift logbook for the PiBeta and Muegamma particle experiments at PSI. File collections. 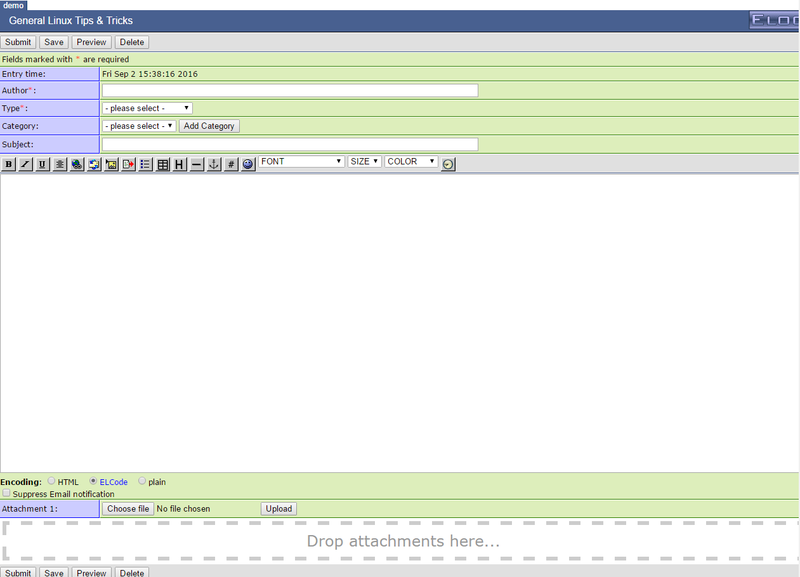 Since files can be attached to ELOG entries, the system can be used to store and retrieve files. This can be used to store configuration files, which need to be accessible by several people over the web, or to store images. Since ELOG features an elaborate query facility, entries can be searched for by specifying several categories. Check Elog Documentation how to modify for your needs this is really simple and effective.